The modern business world is constantly evolving and dictates the new rules of the game every day. It is a responsibility of the online store owners to stay competitive and keep up with the times. To succeed online merchants tend to move to the more advanced platforms. Shopify is the most popular platform chosen for data import. Why? Let’s find out. 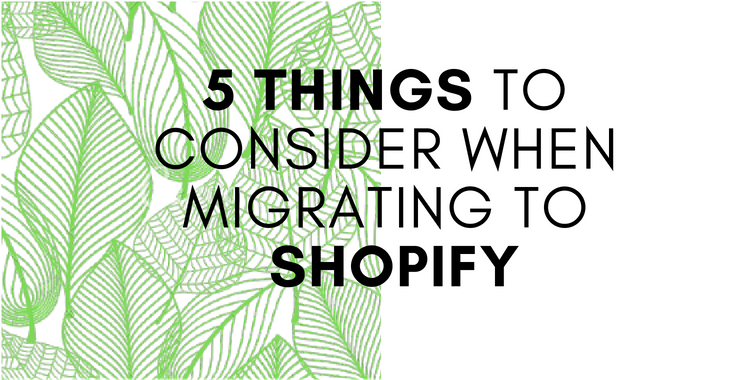 Keep reading and you’ll see how migrating to Shopify can boost your sales and enhance business processes. Shopify comprises the core features of the online shop that are powerful to exploit and maintain on a daily basis. The shopping cart is simple to set up and manage if compared to other platforms. To be more specific, you can make the store go live within 24 hours. The user-friendly platform includes drag-and-drop builder for easy customization by moving the entities around the page to fit your store’s demands. Edit page title and description to identify how your online store appears in search results pages. So, if you get the processes properly, the right potential customers will be attracted to your store faster to make a purchase. Add alt text to images to provide an opportunity for search engines to understand what the visuals are all about. In this case, when your website is more comprehensible to search engines, it can be ranked more highly in the result pages that will bring you more traffic and clients. SEO issues scan. Determine and rectify the potential issues that can affect your e-store’s search engine rankings like poor page title, meta description, etc. Take advantage of Shopify’s ‘SEO Doctor’ extension at no cost. Site speed checks. Make your website load faster to please the search engines and provide the better experience for users. Get higher rankings and bring more visitors to your online shop. The Shopify Starter Plan has some limitations to the maximum of 25 store records. However, another Shopify subscriptions provide you with an opportunity to obtain the limitless amount of items to be added and sold via your online store. Since shopping cart is a hosted platform, you can skip the worries about site loading speed and server performance especially when the e-store obtains too many products. Besides, the solution offers Oberlo extension for new users. Being one of the most popular shopping carts on the eCommerce market, Shopify stands out for over 60 free and paid customizable and mobile-responsive templates. The themes are pre-populated, so your task is to swap in your content and products to start selling immediately. Even if some of the themes seem a little bit pricey in the short term, you can benefit down the line. Integrate your social media feeds such as Twitter or Instagram to reflect your products impressively and boost the purchases. With 100 payment methods to select from, Shopify has a significant edge over other shopping carts. The getaways consist of 3 sections, so you get a possibility to choose the one that satisfies your organization needs the best: major, international, and additional payment gateways by country. One of the primary platform’s benefits is the payment processor provided by Shopify. This quick-to-set up features allows you to manage the payments directly in the user dashboard. So, when you have decided to perform the Shopify import, the next step is to choose the migration method. You can complete the data transfer on your own or hire a developer, yet the switch can take a lot of time and efforts. In this case, take advantage of the Cart2Cart automated migration service to import the entities fast and smoothly. The SaaS offers the total uptime of the current platform and guarantees to treat the information privately. Moving eCommerce data to a new platform can be a difficult decision. There is much to consider and evaluate all pros and risks. Yet you need to settle the issue and step out of your comfort zone to succeed in the long run. Be brave, take into consideration the above-mentioned reasons for migrating to Shopify, run the Free Demo and help your business thrive to stay competitive. Once you turn to Cart2Cart for help you’ll see how the most daunting task is turning into the enjoyable eCommerce experience.